Adventures - Begindnd! - What is Dungeons and Dragons (D&D) about? These products below are suppliments to your D&D experience. The adventures below provide many hours of entertainment with very little or no preparation beforehand. They are generally used in conjunction with the three main manuals and they are here for those DMs who do not have alot of spare time on their hands. Or those who may find it a bit overwhelming to craft their own adventure. The products below are not owned by me and are produced by Wizards of the Coast (or WotC for short). There are amazon widgets to help show you which products to buy to make it just a tad easier for you! A standalone D&D adventure for 4th-level characters. Stonefang Pass wends its way through the mountains of the Stonemarch, home to brutal tribes of orcs. The time has come to clear the pass and gain a foothold, so that it can be used for trade between the town of Winterhaven and the lands beyond the mountains. 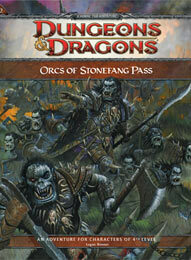 Brave adventurers are needed to rid the pass of monsters and liberate Stonefang Keep from the orcs. Who’s up for the challenge? This standalone D&D adventure is designed for 4th-level characters and can be easily inserted into any D&D campaign. The deadliest dungeon in the D&D world returns! 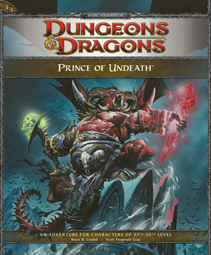 This D&D adventure is designed for characters of 10th–22nd level and includes a full-color, double-sided battle map designed for use with D&D Miniatures. A standalone D&D adventure for 1st-level characters. The tiefling empire of Bael Turath crumbled long ago, but the ruins of its ancient cities remain. Lost within one such ruin is a powerful relic called the Slaying Stone, and brave heroes must retrieve it before it falls into the hands of their enemies! This standalone D&D adventure is designed for 1st-level characters and can be easily inserted into any D&D campaign. This epic-level D&D adventure is designed to take characters from 27th to 30th level. In this adventure, the demon lord Orcus tries to usurp the Raven Queen’s power over death using a shard of evil plucked from the depths of the Abyss. Only the world’s most powerful heroes have the slightest hope of stopping him. This adventure can be played as a stand-alone adventure or as the conclusion of a three-part series that spans 10 levels of gameplay. Fee-Fie-Foe-FUN! 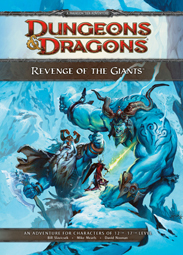 Evil giants seek to avenge past defeats by ravaging the civilized lands, and the only thing standing in their way is a renowned band of heroes. 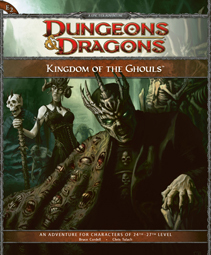 This D&D super-adventure, designed for paragon-level characters, can be played as a stand-alone adventure or serve as the foundation of an entire D&D campaign. This D&D adventure is designed to take characters from 24th to 27th level. In this adventure, demonic forces plot to usurp the Raven Queen's power over death, and all paths lead to an ancient kingdom hidden in the subterranean depths of the Shadowfell. This adventure can be played as a stand-alone adventure or as the second part of a three-part series than spans 10 levels of gameplay. 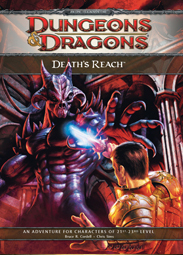 Death's Reach is a D&D adventure designed to take characters from 21st to 24th level. In this adventure, players learn the very foundation of reality is threatened by those seeking to usurp the powers of the god of death. To prevent this cosmic coup, players must trace the disruptions into the Shadowfell's timeless core, where all things find their end. This adventure can be run as a stand-alone adventure or as Part One of a three-part series of adventures (beginning with this one) that spans the epic tier of gameplay. 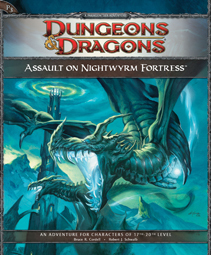 Assault on Nightwyrm Fortress is a D&D adventure designed to take characters from 17th to 21st level. In this adventure, the PCs discover that not all souls rest easy, particularly those spirited away to Nightwyrm Fortress. To learn the truth, players must pierce death's veil itself and entre the Shadowfell, where sinister echoes of life wing through eternal gloom. This adventure can be run as a stand-alone adventure or as Part Three of a three-part series of adventures (starting with P1 King of the Trollhaunt Warrens, and continuing with P2 Demon Queen's Enclave) that spans the paragon tier of gameplay. 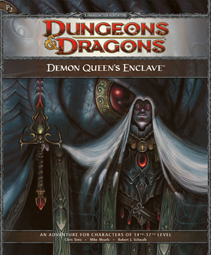 Demon Queen’s Enclave is a D&D adventure designed to take characters from 14th to 17th level. 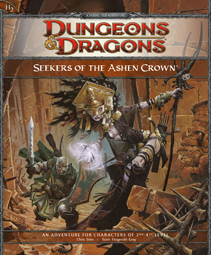 In this adventure, the heroes must unravel the plots of the vile minions of Lolth, the infamous Demon Queen of Spiders. Along the way, they’ll face off against drow, demons, and worse! 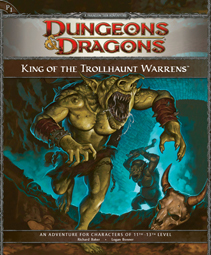 This adventure can be run as a stand-alone adventure or as Part Two of a three-part series of adventures (starting with P1 King of the Trollhaunt Warrens) that spans 10 levels of gameplay. DAVID NOONAN is a game designer for Wizards of the Coast, Inc. He contributed to the 4th edition core rules and co-wrote the Cormyr: The Tearing of the Weave adventure. He lives in Washington State with his wife and two children. CHRIS SIMS works as a game designer for Wizards of the Coast, Inc. His recent credits include the 4th Edition Monster Manual and Dungeon Master’s Guide. RICHARD BAKER has worked as a game designer since 1991. A former officer in the U.S. Navy, he has written or contributed to more than 70 game products, including the rules for both 3rd and 4th Edition Dungeons & Dragons and Axis & Allies Miniatures. Rich is also the author of eight Forgotten Realms novels, including the New York Times bestseller Condemnation. LOGAN BONNER works as a game designer for Wizards of the Coast, Inc. His professional RPG credits include City of Stormreach, Dungeonscape, and the Magic Item Compendium. The ancient trees of the Shadowsong Forest have borne witness to the passing of epochs, and hidden beneath their dark canopies are the remains of empires long departed. Few souls brave enough to explore the primeval forest ever return, for countless horrors haunt the crumbled ruins. When a band of evil criminals seeks refuge within the darkest reaches of the forest, brave adventurers are needed to root them out. The trail leads to the heart of the woods, wherein looms the greatest secret of all — the Pyramid of Shadows. 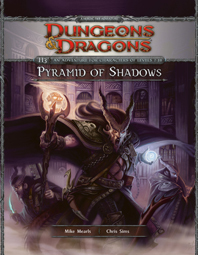 H3 Pyramid of Shadows is a D&D adventure designed for heroic tier characters of levels 7–10. It can be played as a stand-alone adventure or as the final part of a three-part series. 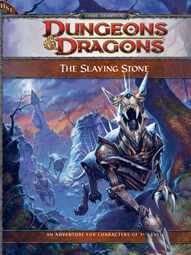 This product includes an adventure booklet for the Dungeon Master, a campaign guide with player handouts, and a full-color poster map, all contained in a handy folder. H3 Pyramid of Shadows is the third adventure in a three-part series that began with H1 Keep on the Shadowfell and H2 Thunderspire Labyrinth. It can also be played as a stand-alone adventure. 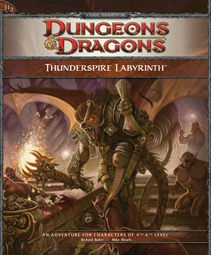 H2 Thunderspire Labyrinth is a D&D adventure designed for heroic-tier characters of levels 4–6. It can be played as a standalone adventure or as the second part of a three-part series. This product includes an adventure booklet for the Dungeon Master, a campaign guide with player handouts, and a full-color poster map, all contained in a handy folder. H2 Thunderspire Labyrinth is the second adventure in a three-part series that began with H1 Keep on the Shadowfell and concludes with H3 Pyramid of Shadows. It can also be played as a stand-alone adventure. 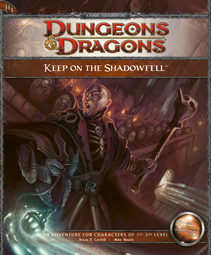 Keep on the Shadowfell is an exciting Dungeons & Dragons adventure designed for characters of levels 1–3. 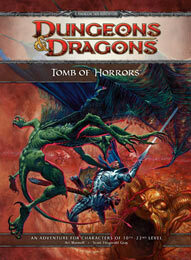 It includes three double-sided poster maps suitable for use with D&D Miniatures. BRUCE R. CORDELL is an Origins Award-winning roleplaying game designer at Wizards of the Coast, Inc. whose previous design credits include the Complete Psionic supplement and the Expedition to Castle Ravenloft campaign adventure. MIKE MEARLS worked as a freelance game designer before joining Wizards of the Coast, Inc. as a roleplaying game developer in 2006, developing rules mechanics for such products as the Tome of Battle: The Book of Nine Swords supplement and the Player’s Handbook II supplement.